The year is 1941. Doreen’s grown-up sisters have left home and she has a bedroom to herself. 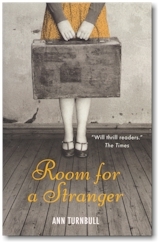 The last thing she wants is to share it with an evacuee – especially Rhoda Kelly. . .
Walker Books, 2nd January 2014. ISBN 978-1-4063-3105-9. e-book available.